When I went to Bihar, I wanted to visit Mahatma Gandhi Setu built across Ganga river. 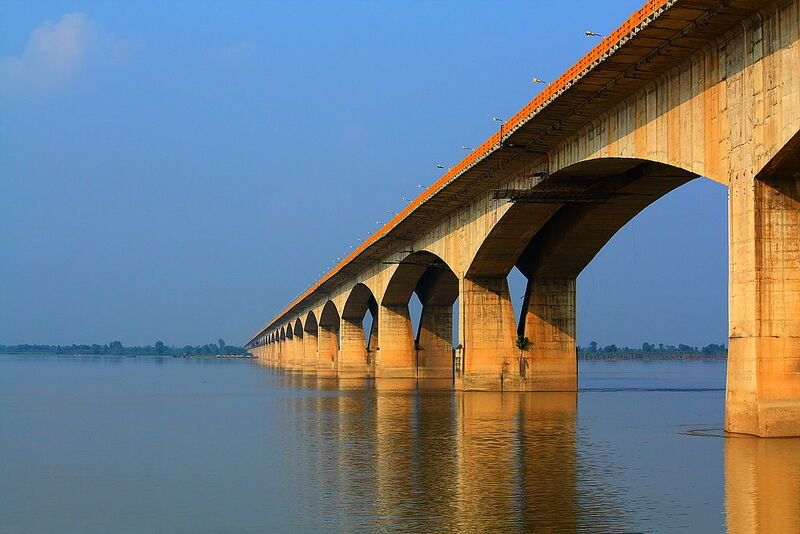 After all, this is the longest bridge in India with a total length of 5.75KM connecting Patna to Hajipur. However, crossing this bridge was a nightmare. There were too many vehicles to cross and bridge was under repair. This repair process was going on for a very long time. What is supposed to be a good journey across Ganga turned out to be a hard one. I still wonder why repair work is going on forever. This is the situation of Indian bridges. There is no comprehensive record of how much weight a bridge can handle, whether new generation super heavy trucks can use that, when to repair, when to decommission etc. There were reports when trucks carrying heavy weights – boilers for thermal power plants etc – had to wait in front of the bridges for weeks to get permission for crossing the same. In many cases authorities denied permission for crossing and the trucks had to retrace and take lengthy routes to reach destination. This resulted in schedule overrun for many projects. Nitin Gadkari, Minister of Road Transport & Highways and Shipping, formally launched Indian Bridge Management System (IBMS). IBMS is being developed to create an inventory of all bridges in the country and rate their structural condition so that timely repair and rehabilitation work can be carried out based on the criticality of the structure. IBMS aims to prepare a data base of all bridges in the country and detailing their structural condition so that timely action can be taken to repair the structures or build new ones in their place. IBMS is the largest platform in the world owned by a single owner, with database that could exceed 1,50,000 bridge structures. So far 1,15,000 bridges have been inventorized, of which 85,000 are culverts and the rest are bridges. Each bridge is assigned a unique identification number or National Identity Number based on the state, RTO zone and whether it is situated on National Highway, State Highway or district road. Precise location of the bridge in terms of latitude-longitude is collected through GPS and based on this, the bridge is assigned a Bridge Location Number. Characteristics like the design, materials, type of bridge, its age, loading, traffic lane, length, width of carriage way etc. are collected and are used to assign a Bridge Classification Number to the structure. These are then used to do a structural rating on a scale of 0 to 9; each bridge is assigned a Structural Rating Number. Rating is done for each component of the structure like integral and non-integral deck, superstructure, substructure, bank and channel, structural evaluation, deck geometry, vertical clearance, waterway efficiency etc. Bridge Rating Number will decide the importance of the structure in relation to its contribution to daily socio-economic activity of the area in its vicinity. Based on this inventory IBMS will analyse data and identify bridges that need attention. Further inspection will be carried out wherever required to improve the operational availability of the structure, enhance its life and prioritize repair and rehabilitation work. The data will help to decide which bridge needs critical attention, or which needs to be rebuilt.